Fairview Farm Wildlife Preserve is home to Raritan Headwaters Association. A former dairy farm, the 170-acre property now serves as a living classroom. Habitat restoration projects and scientific studies are underway to support native flora and fauna, including a number of threatened and endangered species. Visitors to Fairview Farm will find five miles of hiking trails through fields and woods, a scenic pond with a fishing dock, a colorful bird and butterfly garden, two rain gardens and a restored 1800s barn complex. Hikers, birders, artists, dog walkers, photographers, school groups, catch-and-release fisherman and other daily visitors experience nature’s beauty at Fairview Farm, which is open to the public every day from dawn to dusk. The preserve hosts summer nature day camps, an Old Fashioned Country Fair each October, and family-oriented programs throughout the year. Volunteers regularly help out with habitat restoration projects to support native species. Fairview Farm Wildlife Preserve is owned and managed by Raritan Headwaters. Stewardship of the trails, gardens, buildings and wildlife habitats are all funded by voluntary donations. Learn how you can support this special place. Explore the map by clicking on trails and points of interest. To view map options click on the three line navigation icon in the upper left hand corner of the map. November – February: Fairview Farm has a deer management program established as part of its long-term stewardship goals. Deer management is crucial to the establishment of native vegetation and in the fight against invasive plants. Fairview Farm’s deer management program strictly follows NJ State Hunting regulations. 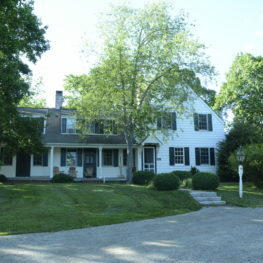 Fairview Farm serves as the main headquarters for our staff, with offices located in two converted houses – a white clapboard farmhouse and a red brick cottage. The campus itself is a hidden treasure, reached by driving through a pair of rustic stone gates off rural Larger Cross Road and proceeding down a half-mile driveway before crossing a small bridge over a stream. The buildings and 150 acres of surrounding land, a former dairy farm, were donated to the Upper Raritan Watershed Association in 1973 by Roberta Zuhlke. Raritan Headwaters operates Fairview Farm campus as a model of environmental stewardship, with our office staff recycling and composting as much as possible to reduce our impact on the land. The farmhouse houses our administrative staff, as well as the policy, development, and land projects departments. The farmhouse kitchen remains, but the parlor and bedrooms have been converted to offices and the former dining room is now a meeting room. The brick cottage, named for our longtime friend and conservation trailblazer Betty Merck, houses our science and education staff, and includes a large meeting room and science classroom. A small outbuilding near the cottage houses our science laboratory and a former garage on the property has been converted into a light-filled interpretive center named the Raritan Room. We have worked to make upgrades to improve the energy efficiency of the farmhouse and cottage, while taking great care to maintain their historic and charming character. 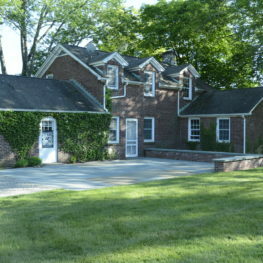 The barns – painted in their original colors of hunter green with white trim – were constructed in the early 1800s with hand-axed native oak beams connected by hand-cut pinned joints. In the late 1990s, URWA’s Board of Trustees grew concerned about the deteriorating condition of the barns and decided to repair and restore them. Vintage Barns of High Falls, N.Y., was chosen for the restoration project in 2000, and completed work in May 2001. The Historical Society of the Somerset Hills honored the project with a Historic Preservation Award in 2005. Today, the barn complex is structurally sound and an integral part of our campus. The smaller barns house a nature education classroom and space for storing property stewardship equipment. 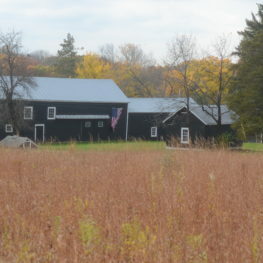 The larger main barn is used for farm-to-table dinners and is the centerpiece of our annual Old Fashioned Country Fair. Fairview Farm Wildlife Preserve is home to Raritan Headwaters Association. A former dairy farm, the 170-acre property serves as a model of environmental stewardship and responsibility. Habitat restoration projects and scientific studies are underway to support native flora and fauna, including a number of threatened and endangered species. Fairview Farm is open every day from dawn until dusk. Captivated by its beauty and historic buildings, first-time visitors often feel as though they have discovered a natural treasure, tucked away off a quiet country road. RHA works hard to maintain a balance between sharing this unique property with the public and protecting it from negative impacts that could arise from intensive human activity. Passive recreational pursuits – nature walks, bird watching, photography, painting en plen aire, nature-journaling, catch and release fishing – can all be enjoyed here. Leashed dogs are welcome. The preserve include five miles of trails through fields and woods, a small pond, a bird and butterfly garden, two rain gardens, a restored 1800s barn complex, and a historic farmhouse and cottage that house the RHA staff. Many members of the local community serve as volunteers to help maintain the property. Fairview Farm has 13 Bluebird Nest Boxes made out of cedar and mounted 4 feet off the ground in grass meadows. This height allows good predation of insects for the parents and a safe height for the young to begin fledging. The bird and butterfly garden in the barn complex at Fairview Farm peaks in mid-August, when a plethora of colorful flowers set the backdrop for fluttering butterflies, birds and other native pollinators. The pollinator habitats serve to attract and feed native pollinators.